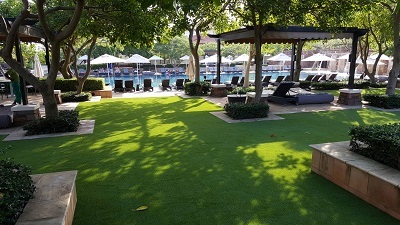 The 5-star resort, Fairmont Zimbali Lodge, on the KwaZulu-Natal North Coast chose to install the natural-looking Easigrass™ in shaded areas around the pool to accommodate guests looking to relax in comfort. The Pool area at the Fairmont Zimbali Lodge is enjoying Easigrass. Easigrass™ is the world’s leading artificial turf brand with headquarters based in London. The South African branch of Easigrass™ forms a unique brand within Durban-based Van Dyck Carpets’ portfolio, part of the PFE International Inc. Group of Companies. Commenting on the decision to use Easigrass™, Director of Operations for Fairmont Zimbali Resort, Evan Harrington, said: “We wanted to investigate the use of artificial grass due to the difficulties our landscaping team was experiencing in getting grass to grow lushly within the shaded areas surrounding our main swimming pool. “We decided to use Easigrass™ as they provided a value for money product that not only improved the overall aesthetics of our pool area, but also allowed us to create additional seating areas around the swimming pool”. Fairmont had 170m2 of Easigrass™ installed – in only three days - because of its many associated benefits including longevity and minimal maintenance. Mehran Zarrebini, head of Easigrass™ South Africa, said they were seeing more hotels and upmarket estates opting for Easigrass™ over lawn, particularly in the common areas such as pools and children’s play areas. Zarrebini said that the severe ongoing drought being experienced across the country, with areas such as the KwaZulu-Natal North Coast being particularly hard-hit, many people were opting for Easigrass™. In addition to Fairmont Zimbali, Easigrass Durban, an accredited Partner and installer for Easigrass™ has installed Easigrass™ at a number of high-profile hotels and resorts including; The Elangeni Hotel (poolside area landscaped), The Umhlanga Sands Hotel and Cabana Beach Hotel (multi-sports’ court areas) and The Oysterbox (outdoor massage cabanas). Easigrass™ Durban is currently installing Easigrass™ at The Maharani Hotel on their rooftop garden for that beautiful-looking grass finish. There are so many uses for artificial grass, ranging from garden landscaping to multi-playing sports’ fields, boardrooms and display areas, the possibilities are endless! All Easigrass™ products have been designed and built to last for several years and the product is completely environmentally friendly. Easigrass™ comes with an eight-year warranty backed by Van Dyck Carpets, specialists in flooring for more than 68 years. The purchase of Easigrass™ is a long term investment and maintaining its appearance is essential. We recommend periodic cleaning, three or four times a year and certainly during spring and autumn. Regular brushing to keep Easigrass™ clean and free of debris is also highly recommended. Easigrass™ is 100% pet and child friendly and we recommend you follow our simple maintenance guidelines. Use a stiff yard brush to remove any pet hair or leaves from the area. To clean pet poo, it should be removed with an implement that will not damage the Easigrass™ and the affected areas should be sprayed with our specialist Easi-Pong™ product which will remove any odours and bacteria. Prepared and distributed for PFE International. For more information, contact Dr. Mehran Zarrebini on 031 913 3800. Distributed by Shirley Williams Communications.